Anglo American • Antofagasta Minerals S.A. • Aurubis • BHP Billiton Plc • Boliden AB • Buenavista de Cobre, S.A. de C.V. • Chinalco Luoyang • Compañia Minera Doña Inez Collahuasi • Compañía Minera Zaldívar • CODELCO-Chile • Daechang Co., Ltd. • Freeport McMoRan Inc. • Glencore • Golden Dragon Precise Copper Tube • Kennecott Utah Copper Corp. • KGHM Polska Miedź S.A. • LS-Nikko Copper Inc. • Metalurgica de Cobre S.A. de C.V. • Minera Antamina S.A. • Minera Antucoya • Minera Centinela • Minera Escondida Limitada • Minera Esperanza • Minera Los Pelambres • Mitsubishi Materials Corporation • Mueller Industries • Operadoras de Minas de Nacozari, S.A. de C.V. • Outotec Oyj • Pan Pacific Copper • Revere Copper Products, Inc. • Rio Tinto Plc • Sociedad Contractual Minera el Abra • Sociedad Minera Cerro Verde S.A.A. • Southern Perú Copper Corporation • Sumitomo Metal Mining Co., Ltd. • Teck • Tenke Fungurume • Wieland-Werke AG • Yunnan Copper Industry (Group) Ltd. In October, Hennie Faul’s two-year term as Chairman of the Board of ICA ended. Hennie ably guided the organization during his term, and the ICA he leaves behind is a stronger and more effective one. The members and management offer thanks to Hennie for his guidance and leadership. Iván Arriagada, Group CEO of Antofagasta Minerals, began his two-year term as ICA’s Chairman of the Board in October 2018. He brings a long history of working with ICA, at Antofagasta and in previous roles, and he is a leader and visionary within the world’s copper industry. Iván will guide the organization through an important phase as we embark on our new ICA 2020 strategic plan. In this capacity, Iván will be instrumental in ensuring ICA is positioned to best serve the needs of an evolving copper industry, now and in the future. 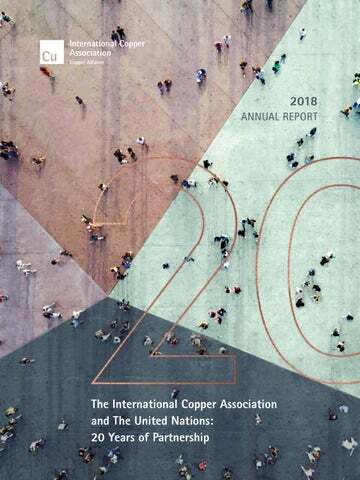 Message to Membership The 2018 International Copper Association (ICA) Annual Report celebrates our 20-year history of partnership with the United Nations (UN). This ongoing and mutually beneficial relationship goes back to 1998, starting with the Common Fund for Commodities (CFC) established by the UN Conference on Trade and Development (UNCTAD). Those early projects focused on energy-efficiency programs in developing markets like China and India. Since that time, our partnership with the UN has expanded greatly and, in this report, we share many of the successes ICA has achieved with the UN during the last two decades. It is fitting that ICA’s work with the UN continues to focus predominantly on the efficient use of energy. Energy efficiency dominates the actions needed to limit man-made climate change to well below 2°C, even more than either renewables or electricmobility. This is underscored in the International Energy Agency’s (IEA’s) Energy Efficiency 2018 report, which states: “the right efficiency policies could enable the world to achieve more than 40 percent of the emissions cuts needed to reach its climate goals without new technology.”* ICA is proud to serve on the IEA Energy Efficiency Industry Advisory Board. In line with the global megatrend for a clean and sustainable energy, ICA’s marketdevelopment portfolio ensures copper maintains a favorable position in the end-use markets that are driving the clean-energy transition. Copper’s inherent physical properties make it indispensable to a clean-energy, low-carbon future; as the best nonprecious conductor of electricity and heat, copper offers significant advantages over competing materials. Additionally, copper is infinitely recyclable, leading to its important role in the ever-increasing trend toward a circular economy. ICA and the United Nations: 20 Years of Partnership The International Copper Association, Ltd. (ICA) has a long and successful history of partnership with various divisions of the United Nations (UN). This work originated in 1998 through the “Copper Energy Efficiency Project” with the Common Fund for Commodities (CFC), which was established by the UN Conference on Trade and Development (UNCTAD). This partnership began with projects on energy efficiency in China and India focused on motors, distribution transformers and ballasts. The collaboration expanded to include regional workshops in Africa, Asia, Europe and Latin America. This early work on regional energy-efficiency programs has served ICA and the UN well, with regional harmonization of standards now a hallmark of ICA-UN projects. Soon after, cooperation began with the UN Development Program (UNDP) on implementation of projects funded by the Global Environment Facility (GEF). This includes the Polish Electrical Motor Efficiency Program, which was ICA’s first partnership with UNDP, in 1999, and the first ICA-UN partnership in a copper center. Other early-days projects with UNDP included the removal of market barriers to energy efficiency standards/ labeling in Asia, establishment of an India motor energy-efficiency technology center, and a global solar water heating program. ICA’s first project with UN Environment, “Global Solar Water Heating Market Transformation,” was established in 2006. The project was funded by the GEF and implemented in partnership through ICA, UNDP and UN Environment. The project was initially focused in Albania, Chile, India, Lebanon and Mexico, leading to increased uptake of solar collectors for hot water preparation including awareness-raising, standards, regulations, training, financing schemes and delivery. The project also resulted in the creation of solarthermalworld.org, a global knowledge-management system aimed at providing the latest information on research, policy and markets for industry, policymakers and influencers. Another area of partnership began in 2008 on providing energy access to the urban poor. Working with UN Habitat, projects started in Africa and then expanded to other parts of the world. These experiences provided ICA with opportunities to work with new partners to develop electrification programs in urban slums, most notably in Brazil. Today opportunities continue for ICA to contribute to the electrification of the world’s poor–one of the most important components of the global sustainable-development agenda. Since 2005 ICA has regularly participated in the annual UNFCCC Conference of the Parties (COP). At COP21, where the Paris Climate Change Agreement was adopted, ICA enjoyed multiple speaking engagements. At COP23, in Bonn, at a U4E event, the Turkish Government announced a countrywide project to upgrade its entire installed base of industrial electric motors (see page 13). At COP24 in Poland ICA participated in multiple speaking engagements, including a discussion on advancing U4E’s partnerships in Africa and a dialog alongside the Chinese Government to promote energy efficiency. ICA is already looking forward to COP25, which will be hosted by Chile, and will provide an opportunity to showcase the copper industry’s critical role in addressing man-made climate change. A long-term project was established in 2006 with UNDP, and with funding from the GEF, â&#x20AC;&#x153;Barrier Removal to the Cost-Effective Development and Implementation of Energy Efficiency Standards and Labeling - (BRESL).â&#x20AC;? The project ran through 2014 in Bangladesh, China, Indonesia, Thailand and Vietnam. ICA and the UN today As ICA’s partnership with the UN matured, ICA strengthened its commitment to common goals. ICA is frequently featured at UN events, including an address to the UN General Assembly in 2015. Similarly, in recent years, ICA’s UN partnerships have grown in scope along with ICA’s ability to leverage like-minded organizations to scale up and accelerate projects advancing the global sustainabledevelopment agenda. Energy efficiency continues to be the driving force behind this work, and as energy efficiency’s role in addressing climate change grows, ICA’s work will continue to expand. Today ICA’s flagship program with the UN is the SEforALL Energy Efficiency Accelerator, U4E (united4efficiency.org). This ICA-UN Environment initiative focuses on market transformations in developing countries to energy-efficient appliances, industrial equipment and lighting. Twenty years after the work with the UN began, ICA continues to enjoy a productive and mutually beneficial relationship with the organization. ICA looks forward to many more years of effective partnership. Motor-efficiency programs are a stable feature in the ICA market-development portfolio. These programs look not only to advance higher efficiency standards for motors, but they also focus on new technologies. An example is the Copper Rotor Induction Motor (CRIM), an ICAdeveloped technology allowing motors to achieve “Super Premium” efficiency without the need for the rare-earth materials required in other motor technologies. Energy-efficiency partnerships in Southeast Asia In 2010, ICA and UN Environment established the ASEAN Energy Management Scheme (AEMAS), an industrial energy efficiency program for the development and adoption of a regional training and certification program for energy managers. The program provided training on ISO50001 to over 5,000 energy managers from factories and buildings in ten countries in the region. This work transitioned to the ASEAN-SHINE program, which successfully fostered the first regional harmonization of energy-efficiency standards for room air conditioners. The ASEAN-SHINE regional model was adopted by U4E, and today work in the ASEAN is expanding to cover additional, high-energy-using products such as motors and distribution transformers. In 2006, the CFC, ICA and the International Copper Study Group (ICSG) developed the “Transfer of Technology for High Pressure Copper Die-Casting in India” project. This led to the establishment of the Non-Ferrous Materials Technology Development Center (NFTDC) in Hyderabad, India, and the building of an “Enabling Technology Center” (ETC). 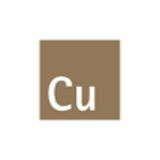 This project provides an example of how ICA-UN programs help to advance a copper-intensive solution. Beyond the UN: Working with governments As a not-for-profit, noncommercial entity, ICA is seen as a credible expert with governments, NGOs and other stakeholders focused on sustainabledevelopment challenges worldwide. On the policy side, ICA has helped 38 countries adopt minimum energy performance standards (MEPS) for motors. In addition, ICA’s program managers work closely with regulatory bodies around the world to develop codes and standards (for buildings, equipment, etc.) ensuring the safe and efficient use of electricity in developed and emerging economies alike. As the world’s “middle class” is set to grow from two billion to five billion people in the next two decades, the need for policies providing equal parts of safety and comfort will only increase. ICA is well positioned to continue this important work alongside its project partners, including the UN. United for Efficiency (U4E) ICA’s flagship UN Partnership rapidly advances For 30 years, since its establishment, ICA and its Copper Alliance® partners have developed and managed energy efficiency projects worldwide. As a result, ICA is recognized as a credible expert and one of the world’s most active and accomplished organizations in the energy efficiency arena. Energy efficiency is one of three pillars in the 21st century energy transition along with renewables and electromobility, and is seen as the leading contributor in climate-change mitigation In many ways, United for Efficiency (U4E) represents a culmination of ICA’s long history of energy-efficiency leadership and its 20-year partnership with the United Nations. U4E is a shining example of the power of Public-Private Partnerships, bringing together like-minded organizations to share resources, expertise and experience to develop and scale-up high-impact projects. Recent editions of the ICA Annual Report have provided background on U4E, which aims to accelerate the adoption of energy-efficient products (motors, transformers, air conditioners, refrigerators and lighting). U4E’s goals, by 2030, are: •	10 percent reduction in global electricity consumption •	Annual CO2 reduction equivalent to the emissions of 500 million passenger vehicles •	Creation of up to $350B in economic impact (through reduced energy usage) •	Avoidance of investments in new power generation of up to $500B The primary source of funding for U4E is the Global Environment Facility (GEF), which has provided nearly $5M to date. Total funding for U4E from its many project partners and from GEF-funded country-level programs (20 thus far) stands at $70M. 2018 was a critical year for the initiative as the project transitioned from the preparatory stage to full-scale implementation. A final audit by the GEF of the U4E preparatory phase resulted in a rating of “Highly Satisfactory.” UN Environment–U4E’s other founding partner—formalized a three-year partnership agreement with ICA to lead implementation and technical efforts on motors, transformers and air conditioners (these products have high potential for copper impact through increased efficiency). A critical achievement was the development of Policy Guidebooks for U4E’s products that provide policymakers and energy practitioners with an A-to-Z roadmap to transform national economies toward energy efficiency through U4E’s proprietary “Integrated Policy Approach.” Model regulations strengthening U4E’s offering to countries are also being developed. U4E is committed to working with at least 40 countries over the next three years. A key deliverable will be on-the-ground training, led by ICA, on the U4E model in these 40 countries. ICA’s approach to this ambitious target is to work with regional blocks of countries simultaneously, with the goal of regional harmonization on Minimum Energy Performance Standards (MEPS). This concept represents an advancement of a successful program, SHINE, in the ASEAN region led by ICA Asia, which resulted in the region’s first harmonization of MEPS for room air conditioners in ten countries. The ASEAN-SHINE model is being expanded to include the other products covered by U4E, and it is being replicated in a number of regions: East Africa, Southern Africa, West Africa and Central America. Early-stage efforts are underway in Central Asia and Eastern Europe. In October 2018, at a meeting in Egypt of the African Union, a provisional agreement was made for a continental-wide harmonization of energy efficiency standards by all 55 nations in Africa through U4E. While in very early planning stages, this is a good example of the reach and credibility of U4E around the world. A final audit by the GEF of the U4E preparatory phase resulted in a rating of “Highly Satisfactory.” U4E was well represented at numerous forums in 2018, including the UN Framework on Climate Chance Convention (COP24), the Sustainable Energy for All (SEforALL) forum and Energy Efficiency Global. U4E enables ICA to expand its geographic coverage into additional countries and to increase copper usage through energy efficiency. Please see pages 14 - 15 for a graphical overview of this geographic expansion. U4E provides powerful evidence of the copper industry’s commitment to the global sustainable-development agenda. ICA encourages members to leverage the positive messages and associated collateral on U4E in their organizations and with important stakeholders. ICA management is ready to assist members in this effort. U4E in Action: Early Replacement of Motors in Turkey The Republic of Turkey partners with U4E to replace inefficient electric motors During a U4E event at the UN Framework Convention on Climate Change (UNFCCC) 23rd Conference of the Parties (COP23) in Germany in 2017, Turkey’s Ministry of Mining and Natural Resources announced an ambitious energy-efficiency project: total market transformation of Turkey’s Small and Medium Enterprises (SMEs) to energy-efficient motors. If successful, this will be the first countrywide energy efficiency project of its kind. The UN Development Program (UNDP), a founding partner of U4E, is leading the project. The project, which will run from 2018 to 2027, presents challenges and opportunities: 1. Minimum Energy Performance Standards (MEPS) standardization: Turkey’s current standard for motors is at a high level—IE3, Premium Efficiency; however, a vast majority of the installed motors are not covered. Because motors can operate for 10 – 20 years or more, it will take many years for the installed base to catchup to the standard. 2. Energy consumption: Turkish industry consumes a large amount of energy. SMEs consume nearly half of the country’s electricity, and 72 percent of that consumption comes from electric motors above 7.5kW. An audit conducted by the Turkish Ministry of Science, Industry and Technology (MoSIT), with funding from the Global Environment Facility (GEF), showed that less than one-percent of the installed base of 7.5+kW motors in Turkey’s SMEs meet the IE3 Premium Efficiency Standard. Moving the installed base to IE3 motors will result in annual electricity savings of 34 billion kilowatt-hours. 3. Diverse market: Thousands of SMEs will need to be addressed through targeted outreach with support from the highest levels of government. Innovative financing is also needed, and ICA is working with UNDP to develop an all-in-one financing facility for the project, with a total project cost estimated at approximately $2B. The GEF-funded audit estimates an average payback period of 21 months, providing an attractive value proposition to motor end users. ICA’s advantage ICA brings a wealth of experience and expertise to the project. ICA authored U4E’s ‘Policy Guidebook for Electric Motors,’ providing a step-by-step, proven approach to market transformations for energy-efficient motors. In addition, ICA is drafting model regulations for electric motors, which will be valuable to Turkish policymakers and energy practitioners in this ambitious project. ICA will also provide ongoing technical assistance to the Turkish government and the project’s partners. ICA and U4E feel this work can be duplicated in other industrialized countries and regions, such as Central Asia (Kazakhstan is a U4E partner country) and Eastern Europe. The regional harmonization of energy efficiency standards is a central pillar of U4E. Countries working together on market transformations based on U4E’s proven “Integrated Policy Approach” have the opportunity to share resources and lower project costs. U4E is exploring options to replicate the program in Chile. Industry and mining consume almost two-thirds of the Chile’s electricity (the copper industry uses about half of this electricity), with about 60 percent of this consumption going to electric motors. In some mining facilities, motors account for up to 90 percent of electricity consumption. ICA brings a wealth of experience and expertise to the project. ICA’s Geographic Coverage ICA and its Copper Alliance® partners manage programs in nearly 50 countries worldwide. ICA’s partnerships with the United Nations enables coverage in additional countries. In some cases, e.g., Southeast Asia, UN partnerships enable increased market-development activity. ICAâ&#x20AC;&#x2122;s UN partnerships have resulted in an ICA footprint in more than 100 countries. Measuring ICA Membersâ&#x20AC;&#x2122; Contribution to Global Sustainable Development Environment and sustainability programs: Essential for the future The UNâ&#x20AC;&#x2122;s 17 Sustainable Development Goals (SDGs) provide a framework to ensure continuous advancement of the global sustainable development (SD) agenda. The copper industry has embraced the SDGs, both through the actions of individual member companies and through the program portfolio within ICA. Proudly reporting the industry’s sustainability trends ICA has been analyzing members’ sustainability data for seven years, evaluating nine indicators, characterizing 10 – 11 million unique copper tonnes annually. ICA tracks CO2 emissions, water drawn, energy intensity, economic value, employment, workforce injuries and sustainability reporting. On average, members surveyed feed $115 billion per year into the global economy and invest $20 billion every year to improve their contribution to sustainable development. To gain a better understanding of the indicator methodology and the data ICA has collected, visit sustainablecopper.org/ica-indicators. A sample of the data collected can be seen in the graphs below. 400 Water Recycled and Reused Intensity In 2016 water drawn from primary sources was used at least twice on average before exiting production sites. Copper Alliance® members surveyed demonstrate continued positive progress in the amount of water they are able to recycle and reuse during copper production. 8 Injury Rate Between 2013 and 2014 the Copper Alliance® celebrated a step change reduction in the injury rate by members surveyed. Significant investment in equipment and training, as well as industrywide use of the OHSAS 18001 (industrial safety and health protection) certification has driven progress on this indicator. ICA members demonstrate sustainability best practices In 2018, ICA gathered stories on member-specific initiatives that align closely with the SDGs and highlight industry best practices. Each case study focuses on the member company’s ability to help the local community, provide technological improvements and reduce the member’s carbon footprint. These case studies offer value for political leaders seeking methods that can be adopted in other mining communities. Select case studies are shown below, and readers are encouraged to visit sustainablecopper.org to learn more. Each case study focuses on the member company’s ability to help the local community, provide technological improvements and reduce the member’s carbon footprint. Saving local habitats and species: Freeport McMoRan demonstrates a strong commitment to stringent standards for conservation at its operations. More than 15 of Freeport’s environmental initiatives have achieved recognition by the Wildlife Habitat Council’s certification program, Conservation Certification. Freeport has introduced wildlife protection plans at each of its North American mines. For example, when activities at the Sierrita mine in Arizona were threatening a local species, Chiricahua leopard frogs, Freeport worked with wildlife officials to relocate over 500 frogs to a national forest in Colorado. Comprehensive approach to sustainable mining: For the ninth year running, Teck Resources has been named to the Dow Jones Sustainability World Index. Teck is putting its approach to sustainable mining into action near Pica, in the Tarapacá region of northern Chile. During Phase 1 of the Quebrada Blanca project (QB1), Teck committed to increasing its renewable energy use to 100 Mw by 2030 to reduce its carbon footprint. In Phase 1, Teck partnered with AES Gener S.A., a top Chilean electricity producer, to develop a power plant with a unique design to utilize solar, wind, hydro and biomass, and a 21 Mw capacity delivering a full 55-gigawatt hours (GWh) per year. As Teck extends this work in to Phase 2 (QB2), the solar plant will be instrumental to helping the company reach its goals. Twenty years after the work with the UN began, ICA continues to enjoy a productive and mutually beneficial relationship with the United Nations. Copper AllianceÂŽ is a registered trademark of the International Copper Association, Ltd. All Rights Reserved. ÂŠ Copyright 2019 International Copper Association, Ltd.